Stamped concrete is patterned or textured to resemble cobblestone/brick, flagstone, slate, or wood (among others). Stamped concrete can be used for patios, walkways, driveways, pool decks, and interior flooring. 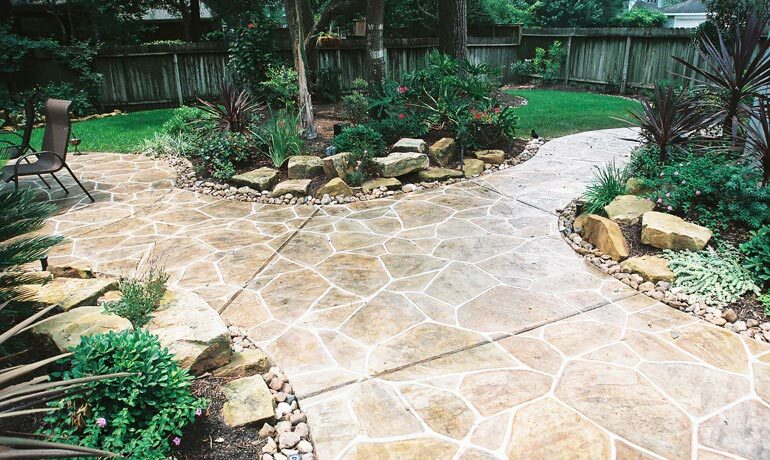 Stamped concrete is a less expensive alternative to natural materials such as stone, slate or brick. There are three steps used in stamped concrete, which set it apart from other concrete procedures; a base color, an accent color (or colors), and stamping a pattern into the concrete. This procedure provides stamped concrete with a color and shape similar to the natural building material. Because of the very nature of concrete, the finished product is often far more durable than the natural materials they are made to resemble. Decorative concrete overlays are applied at 1/4″ to 3/8″ of an inch over new or existing slabs. Overlays are actually stronger and more durable than concrete, making it perfect for residential and commercial use. Acrylic spray deck, limestone, and stamped overlays are common applications for pool decks, patios, and driveways, and are also used for interior flooring.